When it comes to my hair, I fear commitment. I love changing things up but I can't get myself to spend hundreds of dollars on styling and colouring. 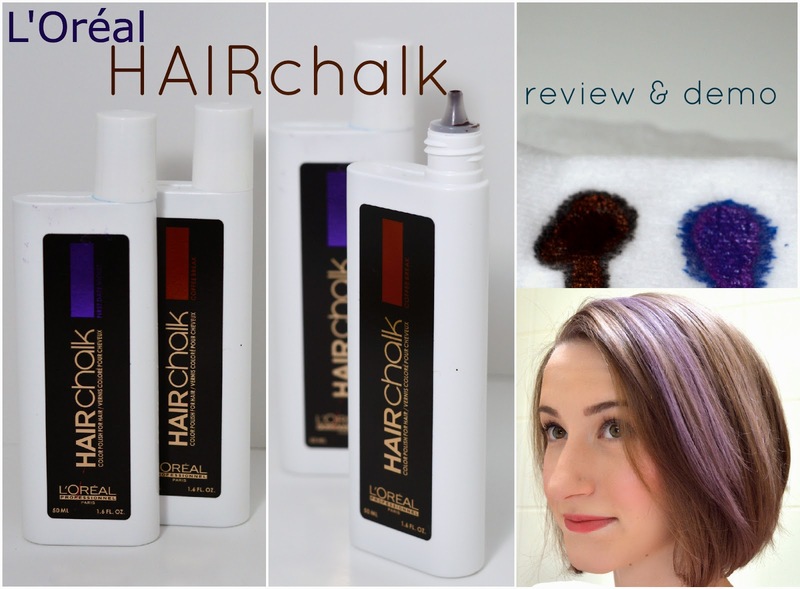 A few weeks back, I was given the chance to test out L'Oréal Professionnel's new HairChalk. This product is marketed as "the first colour polish for hair" providing temporary hair colour with pearlescent pigments derived from makeup. With its "maximum colour intensity" the pigments will show up even on dark hair. The "revolutionary water ink combined with micro fibre polymers limits transfer and ensure a colour that is resistant to water and styling with hot tools". This liquid "polish" does not leave a chalky texture, rather it dries on the hair leaving a smooth and natural finish. The colour will last through 2 shampoos, on average. Each bottle retails for $25 and there are 8 colours in the range. For "at-home application" the instructions say to pour a few drops of product onto an applicator or makeup-sponge, then apply onto the desired section of hair. You are then supposed to brush out and blow dry the product into the hair. I applied these colouring products to damp, clean hair which had no other product on it. 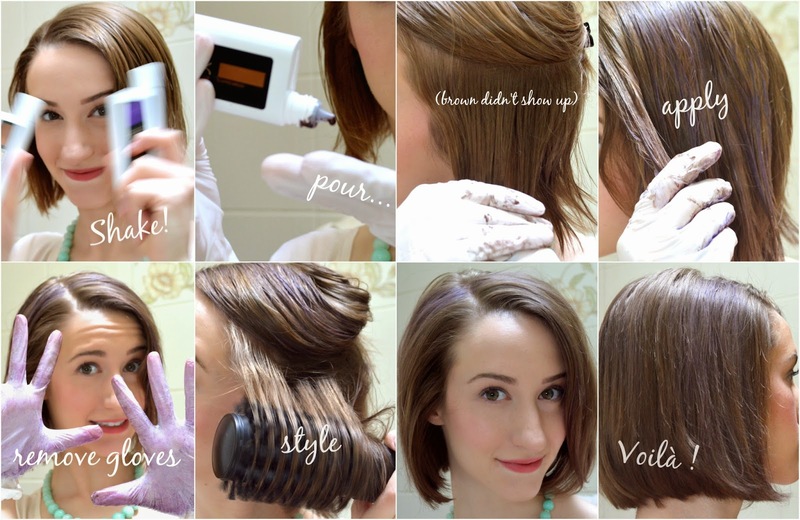 I styled my hair using the Conair Infinity Pro Spin Air Brush, which I reviewed here. I was initially sent the shade "Coffee Break" which did not show up on my dark blonde/brown hair. I was then able to try the shade "First Date Violet" which had a much more vibrant colour. I did try using the makeup sponge technique for application, but it was a slight fail since the sponge ended up soaking up so much liquid that I couldn't get much on the actual hair. Therefore, I resulted to applying the product with my hands, using rubber gloves. To be quite honest, I can't see this product showing up very well on darker hair. If you crave some vibrant highlights or lowlights, your hair would have to be a bright blonde for this product to work really nicely. Now, would I purchase this myself? 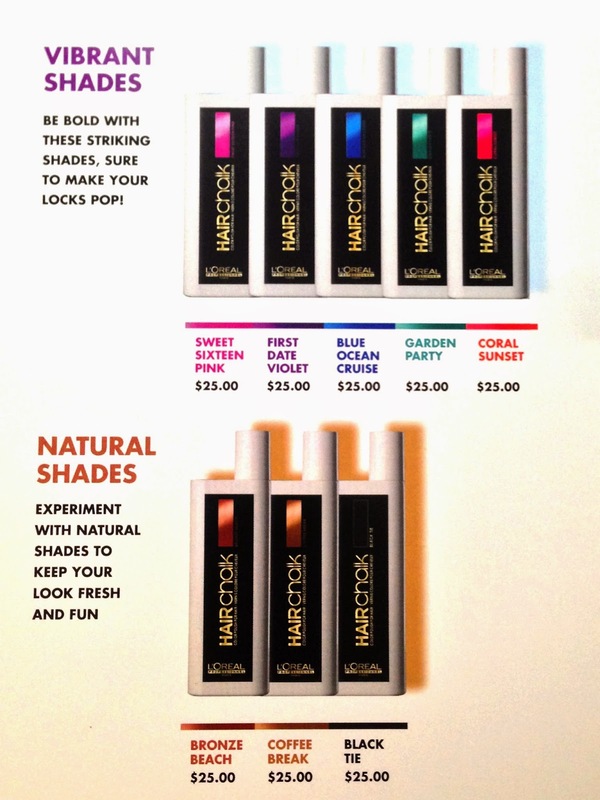 $25 is a bit steep for a product that comes along with less-than vibrant results and a slight mess. Although, I wouldn't mind trying one of the pink shades, especially if I ended up putting it all over my head for a temporary full dye. Now seeing how muted the colour turned out, I'm definitely planning on using both the brown and purple all over my hair to see what a heavier application looks like. I really enjoyed the feel that this liquid gave to my hair, since it provided some great texture and volume right after styling. I wouldn't classify this product as "hair chalk", more so as a temporary non-transfer liquid dye. Wanna see real hair chalk? Read on! Following my application of L'Oréal Professionnel's HairChalk, I layered on a coat of my trusty Kevin Murphy Color Bug. I've had this purple hair chalk for around 3 years now, and it still works just as well as day one. It comes in a powder compact form, exactly the same as an eyeshadow. Actually, you could use a matte, pigmented eye shadow for a similar look. 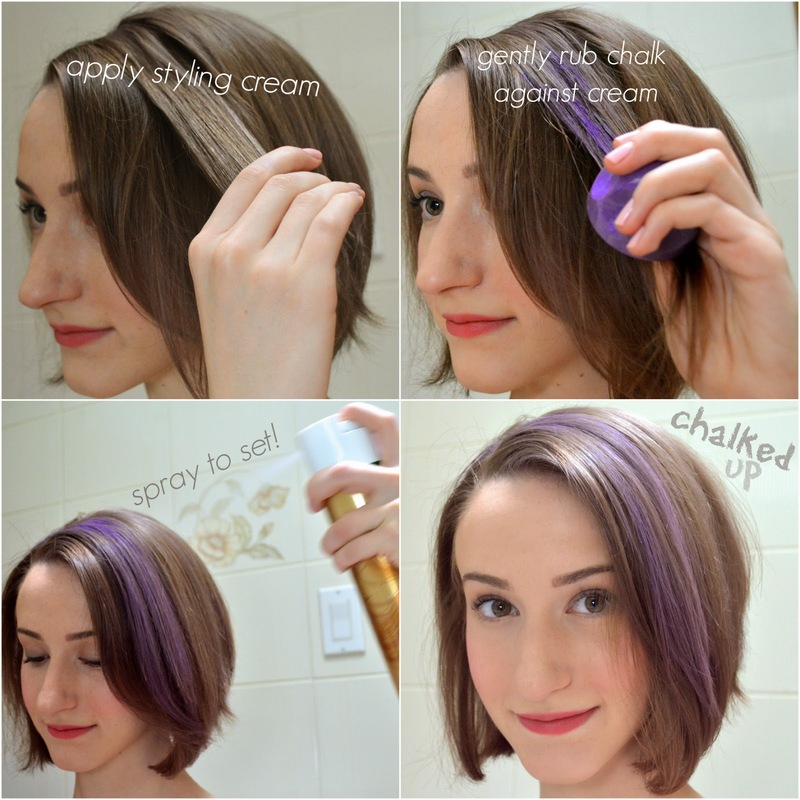 Simply apply some type of texturizing cream, run the powder over the section of hair, then set with hairspray. Throughout the day, the powder will begin to brush off and fade, and can transfer onto clothing or sheets. 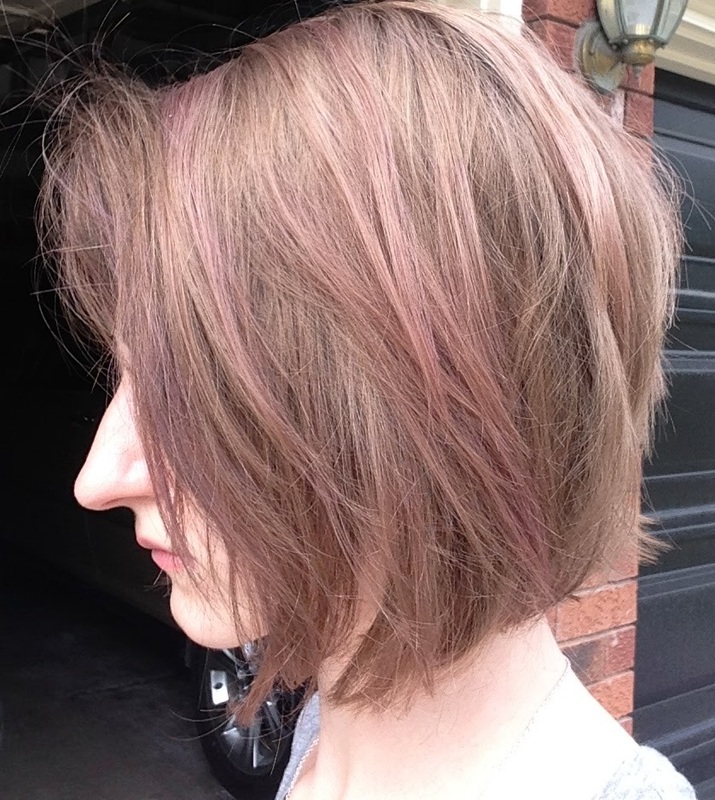 Here is a great review of the pink shade of Kevin Murphy's Color Bug from Hair Romance blog. colour has faded after the first wash. Does it transfer onto my sheets? HairChalk: No. Color Bug: A bit! HairChalk: Yes- 6 months after opening. Color Bug: Yes, 12 months after opening. HairChalk: Spain. Color Bug: China. HairChalk: $25. Color Bug: around $20. HairChalk: Two washes. Color Bug: One wash. Overall, these very different "hair chalks" are a lot of fun and not incredibly difficult to use. They provide temporary colour and a whole lot of glam to any hairdo. If you're looking for a product to liven up your (light coloured) hair, I'd recommend trying out either product, depending on what effect you're looking for. HairChalk is available at L'Oréal Professionnel salons for purchase, or to incorporate into your salon style.